March 26, 2017—-Following is a recent article concerning Bangladesh, child labor and the polluting tanneries published by the Associated Press. Such a good article. Bangladesh is going through its most difficult time and things seem to get worse. Climate change will severely affect Bangladesh for sure and also the rise in tanneries and unregulated brick fields are ruining the environment so badly. Corrupt politicians can not see this as most of them are uneducated and corrupt. But thanks for identifying some good and concerning sides. Good job and good luck to Bangladesh. DHAKA, Bangladesh (AP) — Hazardous, heavily polluting tanneries, with workers as young as 14, supplied leather to companies that make shoes and handbags for a host of Western brands, a nonprofit group that investigates supply chains says. The report by New York-based Transparentem, released to The Associated Press on Friday, didn’t say leather from the tanneries ends up in American and European companies’ products, only that the manufacturers of some of those goods receive it. Some companies say they’re certain the leather used to make their products was imported from outside Bangladesh, and the manufacturers concur. Still, in response to the report most brands had switched factories, banned Bangladesh leather or demanded improvements and audits. The abuses alleged have long plagued Hazaribagh, a Dhaka neighborhood that’s the hub of Bangladesh’s leather industry with more than 150 tanneries. The air is noxious with an eye-stinging rotten-egg odor, and children play on small hills of rotting hide trimmings. The Buriganga River, a source of drinking water for 180,000 people, shimmers with poisons from tannery chemical runoff, as well as other human and industrial waste. The $1 billion-a-year industry was ordered to shut down and move more than 15 years ago, but deadlines have passed without consequence and fines go unpaid. 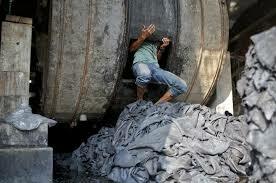 Last week, Bangladesh’s High Court told authorities to stop supplying gas, water and electricity to the tanneries. Rawhide supplies have also been ordered halted. And yet they’re still in business, fueled by consumer demand for ever-more-stylish but low-priced wallets and boots. 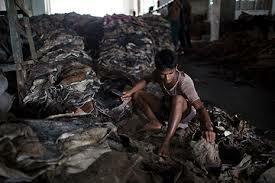 Bangladesh law prohibits workers under 18, but some appeared to be teenagers. The report says that in 2015, a mother confirmed her child working in a tannery was 14. Footage from 2016 showed the child was still working there. On the video, a 17-year-old told the videographer his age. And there’s 2016 footage of two workers agreeing that there are 15-year-olds onsite. Using customs records and business documents, they found those factories make shoes and purses for Clarks, Coach, Kate Spade, Macy’s, Michael Kors, Sears, Steven Madden and Timberland. Also included were Germany-based Deichmann, a shoe and sportswear chain, and two U.S. firms – Harbor Footwear Group and Genesco – which design and market shoes in even more brands. “We tell brands and retailers what they may not, but should, know about those with whom they do business. This gives them the opportunity to use their influence with their suppliers to address questionable activity and advance positive action,” Skinner said. The American and European brands that responded to queries from the AP stated their commitments to prevent labor abuse in manufacturing. But some brands, the Bangladeshi companies involved and industry officials disputed the report’s findings. Syed Nasim Manzur, managing director of Apex Footwear and a director at the Apex Tannery, calls Hazaribagh “an environmental disaster” and said they’ll soon close their plant there. But he said the report is a “smear campaign,” allegations of child labor are unsubstantiated, and Hazaribagh leather doesn’t end up in exported products. Coach – whose website says their produce is “handcrafted from the finest American and European hides and textiles” – said they get no more than 1.5 percent of their leather from Hazaribagh and Kate Spade said they get just 1 percent. Both said they’re stopping any purchases from Hazaribagh. Michael Kors and Harbor Footwear said they were a few steps removed from the Hazaribagh tanneries, hadn’t knowingly sourced leather there, and would make sure not to. Deichmann said Apex Footwear only makes their shoes with imported leather or hides processed at Apex Gazipur tannery that they’ve audited. Sears, Timberland, Macy’s, Genesco and Steven Madden all said that while they weren’t getting leather from the tanneries, they saw an opportunity to use their companies’ leverage at the related factories to bring improvements, with some using threats, others offering auditors and support. Attorneys representing Apex Footwear and Macy’s, Steven Madden and Genesco signed an agreement last month that says Apex will verify that all tannery workers are adults using protective gear, and that independent auditors would oversee longer-term improvements. “This principle applies, whether or not leather from the tanneries in question is being used in a brand’s products,” he said. AP journalists were not allowed inside Apex and Bay’s Hazaribagh tanneries, but workers walking out said no children were employed there now. “If the owners provide us with these things, it will improve the situation,” he said. 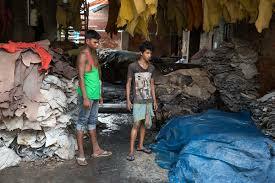 A British Medical Journal study published this week found that Bangladeshi tannery workers as young as 8 frequently have untreated rashes and infections, as well as asthma and other lung problems. Pure Earth – a nongovernmental organization that addresses industrial pollution – has put Hazaribagh on its Top 10 list of polluted places, along with Chernobyl. 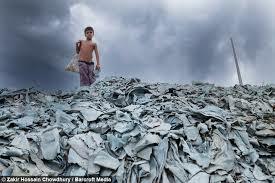 Similar problems exist at tannery clusters in the Philippines and India. “Consumers should be asking plenty of sharp questions on the shop floor about what retailers are doing to guarantee they are not sourcing leather from Hazaribagh’s toxic tanneries,” he said. Categories: Building Green, Climate Change, Pollution | Tags: #bangladeshtanneries, #climatechange, Environment, Pollution | Permalink.